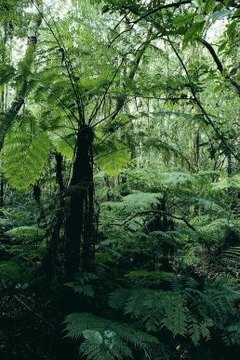 Rain forests cover less than 6 percent of the Earth's surface, yet are teeming with more than 50 percent of the world's plants and animals. Among the rich diversity of wildlife found in the deep, dark rain forest in the Democratic Republic of Congo in Africa is the Congo peacock, an intriguing bird discovered in 1936 showing characteristics of both peafowl and guinea fowl. It is the only peacock that lives in rain forests, and the only member of the pheasant family endemic to Africa. Peacocks are the male members of the peafowl species -- females are called peahens and babies are peachicks. The Congo peacock is not studied as extensively as the Indian peacock, also known as the blue peacock, or the green peacock, due to their shyness and inaccessible habitat location in the depths of the central African rain forest. The Congo peacock doesn't share the majestic train of plumage that is the trademark of the blue and green peacock species, but they are just as colorful and display an impressive tail fan during mating rituals. Males are distinguished by dark bronze-green upperparts and black underparts, a conspicuous crest of short, dense black and white bristles, a featherless red throat, a gray bill, gray feet and a long spur known as a metatarsal thorn on each leg, common to males in the Galliforme order and used in intraspecific fights. Their wing-coverts are violet-blue as well as their breast and the end of their tail feathers. Males are between 25 and 27 inches in length, and the slightly smaller peahens are rusty-brown with glossy, metallic emerald-green upperparts and a short russet crest. The ground-dwelling Congo peafowl occurs in different forest types throughout the rain forest, but prefers high canopy and litter cover. Not restricted to primary forest, peafowl also use the adjacent old secondary forest which is patchy and provides a relatively open floor for foraging. Peafowls are omnivores and thrive on a fairly diverse diet of fruit and berries from common tree species, wild figs, flower petals, seed heads, insects and other arthropods and invertebrates, small mammals, reptiles and amphibians. With their mating and nesting activity mostly studied in captivity, peafowls have been observed living in strong-bonded pairs and small family groups that defend a shared territory, the website ARKive reports. The dramatic courtship ritual begins with the male fanning out his vibrant tail and wing feathers as he struts, bows and offers food to the female. Peacocks and peahens sing to each other in 20 to 30 repetitions, their mating duets preceded by a loud "rro-ho-ho-o-a," then males give a high-pitched "gowe" and the female responds with a low "gowah." The female lays a clutch of one to four eggs in a hollow in the ground and incubates them for about 28 days. Males stay close and guard the nest, and the female leaves only to feed. Both parents help rear the peachicks by brooding, protecting and feeding them. The chicks develop quickly and are soon able to leave the nest and forage for themselves. The Congo peafowl populations are dwindling due to hunting pressure and habitat loss from mining, logging and subsistence agriculture, and future forest exploitation is expected to continue to compromise populations. In addition, the demands of war in the region have exacerbated the problem with guerilla fighters and Rwandan refugees occupying the eastern Democratic Republic of Congo since 1994, increasing the already substantial hunting and habitat pressures. Outside of parks and reserves where the Congo peafowls are protected, they are frequently victims of snares intended for small mammals and antelope. In 2004 to 2005, fieldwork in Salonga National Park revealed irregular and sparse populations with individuals spotted only every few miles. Classified as "vulnerable" on The International Union for Conservation of Nature Red List of Threatened Species in 2006, the Congo peafowl's survival in the wild may depend on populating them in protected areas where hunting could be limited or banned. Currently found in the Okapi Wildlife Reserve, Kahuzi-Biega National Park, Maiko and the Salonga National Parks, this bird's future still remains uncertain due to the unstable nature of the political climate in the country. Education about the bird's ecology also needs to be improved throughout the reserves. In case the Congo peafowl becomes extinct in the wild, about 150 are kept in captivity and an international studbook is maintained to ensure the species remains genetically diverse and healthy through selective breeding. Extensive conservation research is ongoing into the ecological needs of the species to help ensure it thrives in the wild.